The 1944 Judy Garland musical is planned for Blu-ray in December. 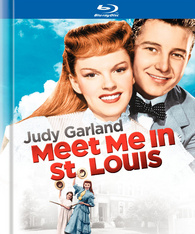 In an early announcement to retailers, Warner Brothers has revealed 'Meet Me in St. Louis' is heading to Blu-ray on December 13. The beloved classic directed by Vincente Minnelli was nominated for four Oscars including Best Cinematography, Best Music - Original Song (The Trolley Song), Best Musical Score, and Best Screenplay. Specs have yet to be revealed, but the release will apparently come housed in a limited edition digibook and supplements will include Introduction by Liza Minnelli; Audio commentary by Garland biographer John Fricke, actress Margaret O'Brien, screenwriter Irving Brecher, songwriter Hugh Martin, and Barbara Freed-Saltzman, daughter of producer Arthur Freed; 3 documentary specials - Meet Me in St. Louis: The Making of an American Classic, Hollywood: The Dream Factory, and Becoming Attractions: Judy Garland; The 1966 pilot for the Meet Me in St. Louis TV series; 2 vintage shorts - 1930's Bubbles and 1941's Skip to My Lou; and Audio Vault featuring an outtake of "Boys and Girls Like You and Me" and a 1946 Blu-ra Blu-ra Lux Radio Theater broadcast. You can find the latest specs for 'Meet Me in St. Louis' linked from our Blu-ray Release Schedule, where it's indexed under December 13.